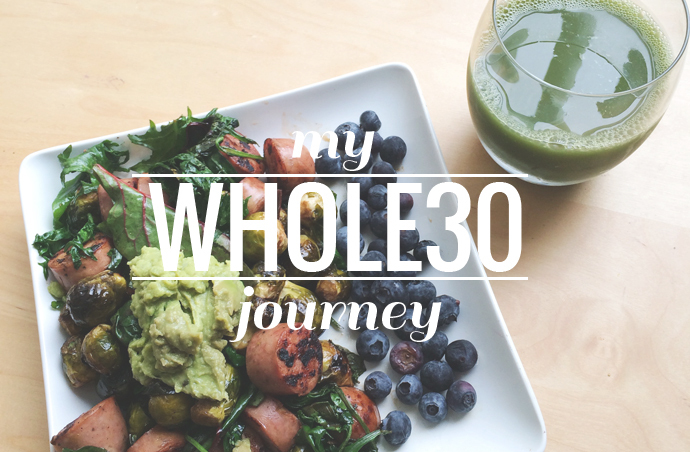 Thursday marked my first day on the Whole30 eating plan! I've been considering taking on this challenge for over a year now, ever since my friend Katie did it. I put it off for a long time, thinking that I could never have the willpower to do it. Well, lately I started thinking about it more and more, checking out the Whole30 website, and reading a lot of blog posts about it. And guess what? I decided that I could do it. Me. And that there was no time like the present. So here I am towards the end of day 3! For those of you who don't know what Whole30 is, it is a 30 day eating program that is designed to change your relationship with food and give you loads of health benefits, such as better sleep and more energy! You strip your diet of things like dairy, legumes, grains, soy, and added sugar of any kind. Instead, you eat simple, whole foods; You get your nutrition through 3 large meals filled with meat protein or eggs, loads of veggies, some fruit, and healthy fats from good oils, nuts, and avocados. Those are just the basics of the program, but I really encourage you to check out the Whole30 site to make a bit more sense of it! I have been doing tons of research and have found that many people continue eating this way because of how amazing it makes them feel! It is also a great way to kickstart weight loss and keep the weight off. My hope is that I will feel so great at the end of the 30 days that I will want to just continue eating this way! I am also hoping to begin losing weight and the journey of getting my health in check. I need to be the best me that I can be! Are you trying to become healthier in 2015? What's your plan? Wow! So much respect! I tried something similar once, but I was sooooo tired from not eating any grains. I decided that my body just needs grains to function haha. Let me know how it goes though, maybe I just didn't give my body enough time to adjust! best of luck! my only concern would be what to order when going out with friends. let me know how you handle that aspect of it. i don't want to be a hermit and only eat at home! Good luck! I'm thinking of doing a Whole 30 challenge also, probably in March! I've noticed a few others bloggers are starting their Whole30 journeys and my only question is: How does it affect your grocery budget? Thank you! I have heard about people really struggling with grain/sugar withdrawals the first week or so, but I have actually been doing pretty well! You should definitely give it another shot and hopefully you will get over that hump and feel better! Yeah I've noticed that too! New Year and all ;) Hmmm that is a very tough question considering that I didn't really buy groceries much before! I never planned meals out and usually just figured things out as I went along, so I didn't really have a grocery budget haha. BUT, I would say that depending on how you plan it out, it would be about the same or maybe a bit more. I basically just buy meats and veggies/fruit, which you can get good deals on! Also, if you think about it, by eating this way you can avoid potential health problems, which could cost you more in the end. Something to consider. Thanks, I'll definitely consider it. So excited for you! How are you doing with it so far?